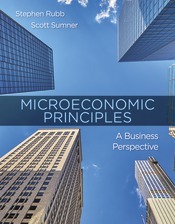 Economic Principles: A Business Perspective covers the fundamentals of economics in the context of today’s globalized business world, with strong examples, integrated technology, and practical pedagogy. Integrated business and policy briefs, in-depth case studies, chapter-ending business applications, thoroughly explained graphs and a battery of simple but useful learning tools support the intersection of theory and practice. It’s accompanied by a robust media component, SaplingPlus, which combines Sapling’s acclaimed online homework with a complete e-book and all interactive features for the text.